The human body is an intricate machine; everything is connected in one way or another. This means that when one part is not functioning as it should it can throw everything out of balance. The relationship between the feet, back, and hips is significant, so when there is a problem with feet it can cause pain in those areas. Fallen arches is a foot problem that is a very common cause of lower back pain. However, many people who have fallen arches don’t even realize that they have an issue. There are more than 100 ligaments and muscles in the foot that stabilize the bones and keep everything in the proper position. Ligaments prevent joints from extending beyond their intended limits. They contain elastin which allows them to act much like a rubber band, stretching with movement or flexion then returning to their normal length when the joint returns to its resting position. There are variety of things that can happen that cause those ligaments to stretch, causing them to lose their ability to support the foot as they should. This can lead to pes planus (flatfeet), also known as fallen arches. Most people don’t realize that there are actually three arches in the foot, not just one: lateral, medial, and anterior. They act as shock absorbers for the body. When they don’t function as they should, don’t absorb the shock of movement and activity, it puts added wear and tear on the body. While foot, knee, hip, and back pain is common with fallen arches, it also is a major cause of impaired functioning of the lower extremities. It can also lead to balance problems. The primary cause of fallen arches is improper footwear. Shoes that do not adequately support your foot and arch can lead to structural problems. 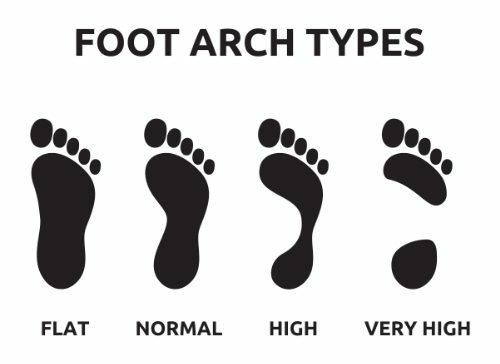 Recognizing the symptoms of fallen arches and knowing that you have a problem can help to prevent the pain but can also arrest further damage to the foot. Do you have Fallen Arches? While many people with fallen arches experience no symptoms or problems, others do. If you experience any of these symptoms of flat feet, it should prompt a visit to your doctor. Look at your footprints. If you see a footprint that shows the heel and ball of your foot with a thin, curved imprint running along the outside, then your foot structure is normal. If you can see the imprint of your entire foot then you probably have fallen arches. The problem with fallen arches is that the damage cannot really be reversed once it begins. However, the progression can be stopped with proper treatment. The treatment for fallen arches depends on the cause and severity of the condition. If it isn’t causing pain or other problems, the doctor may elect to do nothing. However, if there is pain or mobility issues present, treatments may include bracing, prescribing NSAIDs for pain and inflammation, and even surgery in some cases of torn tendons or broken bones. An increasingly popular treatment for fallen arches is chiropractic care. This natural, non-invasive therapy treats the whole body so that it addresses the cause of the condition as well as associated risk factors and helps patients manage the pain, greatly improving their quality of life.